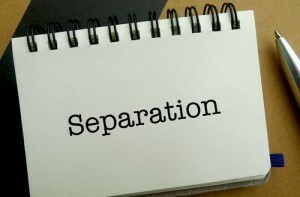 Most trial separations eventually result in divorce, because very often one of the spouses has already begun the disconnection of emotional divorce. Trial separations should reveal what needs to change in the relationship to make it work again. Sometimes, a person asks for a trial separation as a cover for an affair or to be free to date, or to soften the blow of asking for a permanent separation or divorce. Couples try a trial separation when destructive conflict makes one (or both) of them believe that the relationship is failing. Trial separations typically also involve a physical move but tend to be longer-term than brief separations. Some couples choose a trial separation after revelation of an affair or recognition of long-term dissatisfaction in the relationship. A trial separation puts the relationship at risk of ending. That decision remains open for future consideration, which can be very unsettling and painful for one or both partners. No one should undertake a trial separation with the expectation of an automatic reunion. During trial separations, the goal may not be to work on the relationship, but to work on the individual. This must be clarified. Much may be revealed in the course of the separation. Separated spouses taste life without their partner and begin to see what it would be like to separate and be alone. In most cases, one partner wants this type of separation more than the other. One partner may feel an enormous sense of relief at being free, while the other partner feels fear, insecurity, abandonment, anger, or rejection. Sometimes the tables turn. Sometimes the partner who chooses the separation discovers how much he or she appreciates and loves his or her partner. Sometimes the partner who is left is the one who ends up experiencing the greatest sense of relief.